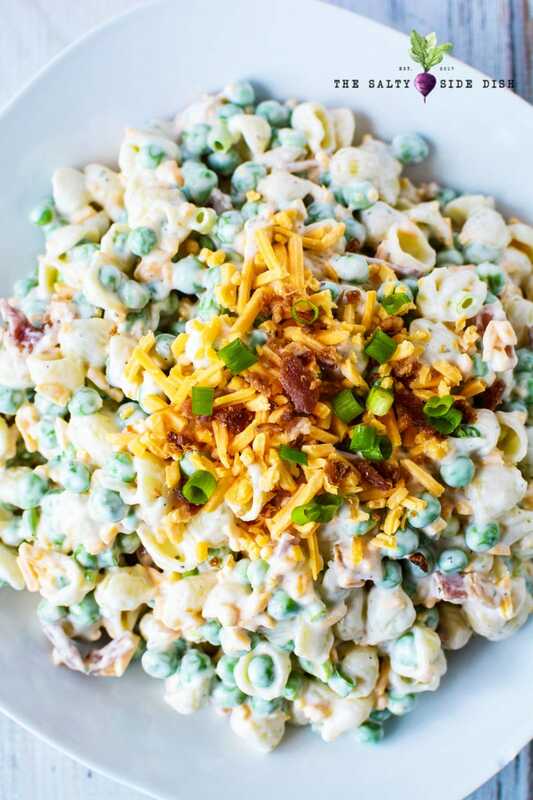 Move over pea salad, because ranch pasta salad with peas is taking your place! 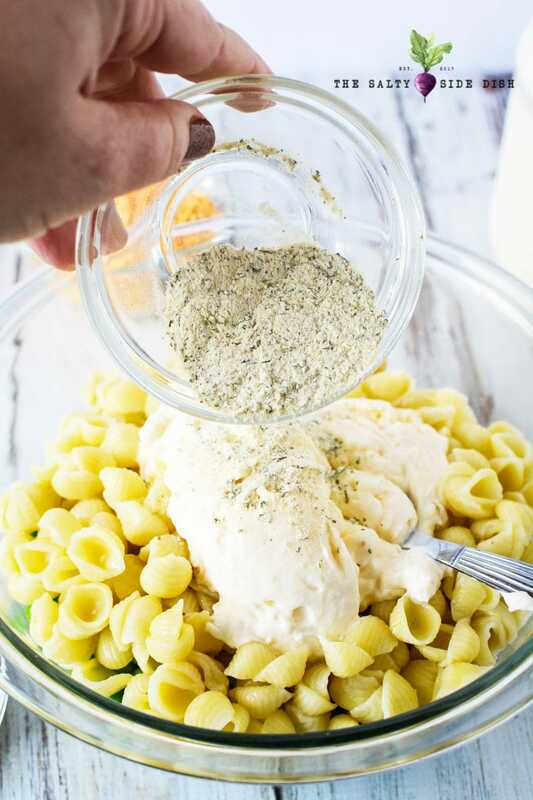 Not just covered in mayo, the tangy spices of ranch combined with the bursting flavors of bacon and cheese make this a pasta salad for the books. Pretty good? No, pretty amazing! Of course I love nearly all pasta and veggie salads for their own unique flavors and textures. 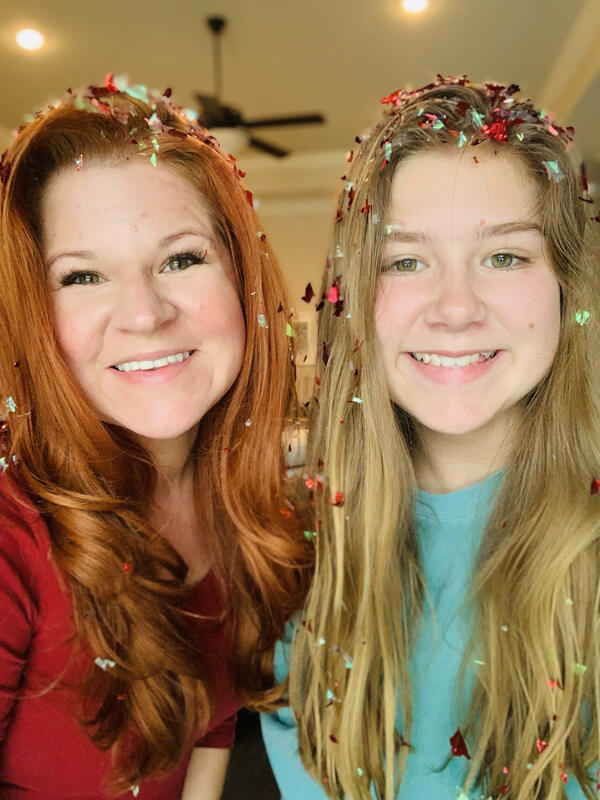 Try Hawaiian Coleslaw, Old fashioned macaroni Salad, red potato salad, caprese salad and even an ambrosia salad for flavors that cannot be beat. Ranch is one of those rare sets of spices that pretty much goes good on everything. I mean, what else can you enjoy dumped all over lettuce and simultaneously mix in hamburger meat, right? Pasta salad is no exception! 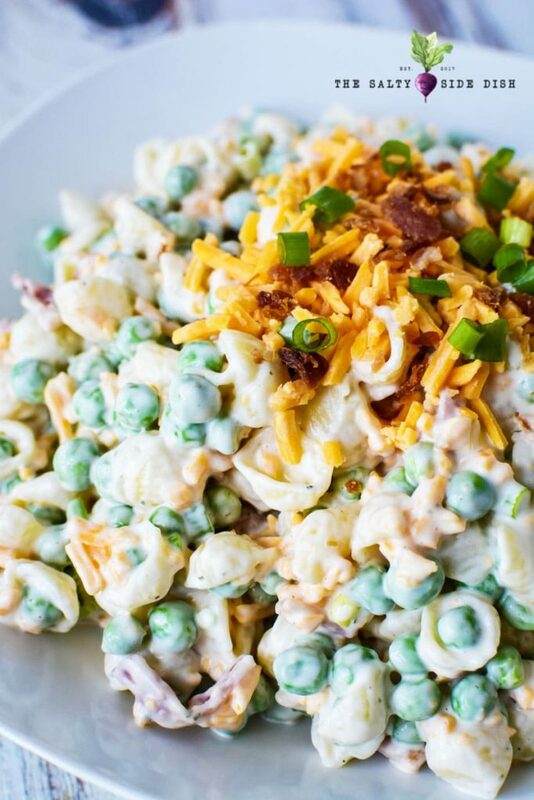 This ranch pasta salad with macaroni, onions, bacon and peas is practically a main meal all on its own. Such an easy ranch pasta salad to make that you can make even if the party is last minute. As all salads like this are, the time you leave in the fridge and marinate is usually ideal for savoring the flavor, but don’t be afraid to serve straight out of the kitchen if you are pressed for time either. This pasta salad is pretty good and versatile like that! Tip: I buy ranch seasoning in a bottle instead of the little bags at the store. It keeps really well and you have a ton on hand for a variety of recipes. Absolutly get one! Cooking time on the pasta is 8-10 minutes, plus water boiling. And then basically everything else is toss and mix. So I’d say about 10 minutes for that. Cook macaroni according to package directions, drain and rinse with cold water. If you leave your pastas hot, it can melt your dressing and no one likes a warm mayo mixture. 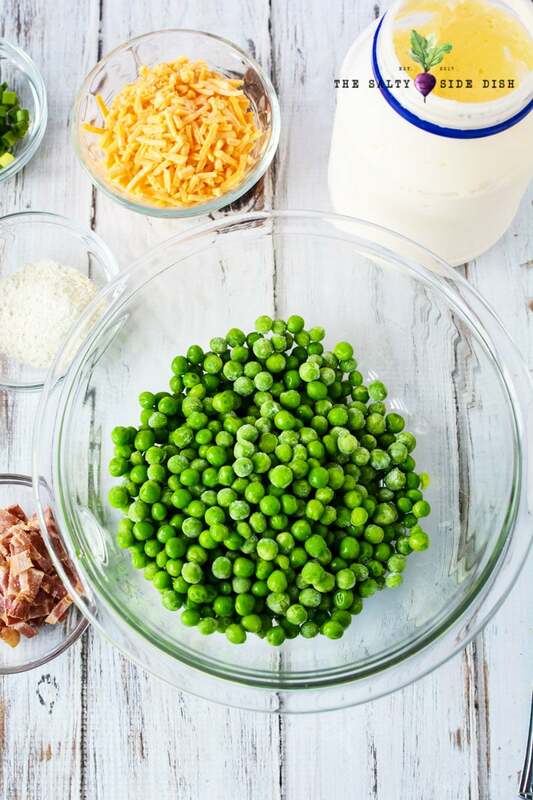 In a large mixing bowl, add pasta, peas, mayonnaise, cheese, onions, bacon and ranch seasoning. For best results, refrigerate for 2-4 hours or overnight before serving. Top with additional cheddar cheese and bacon before serving (if desired). 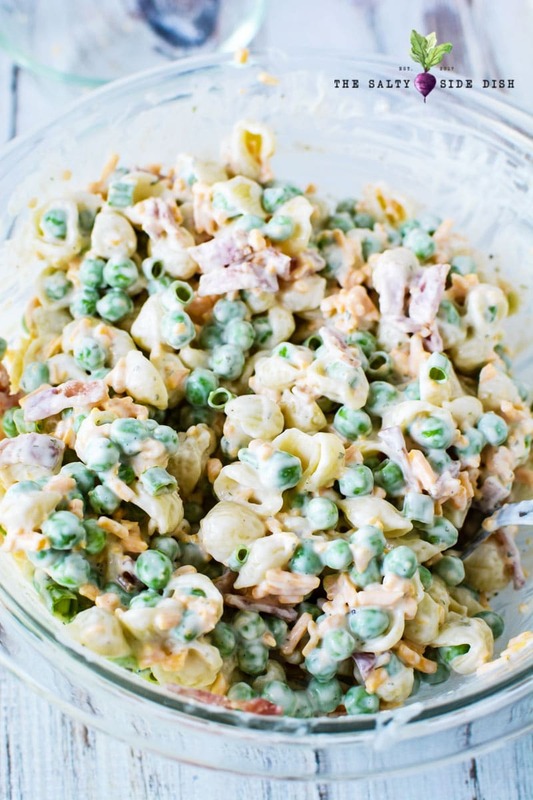 Ranch pasta salad with peas is the best pasta salad EVER! 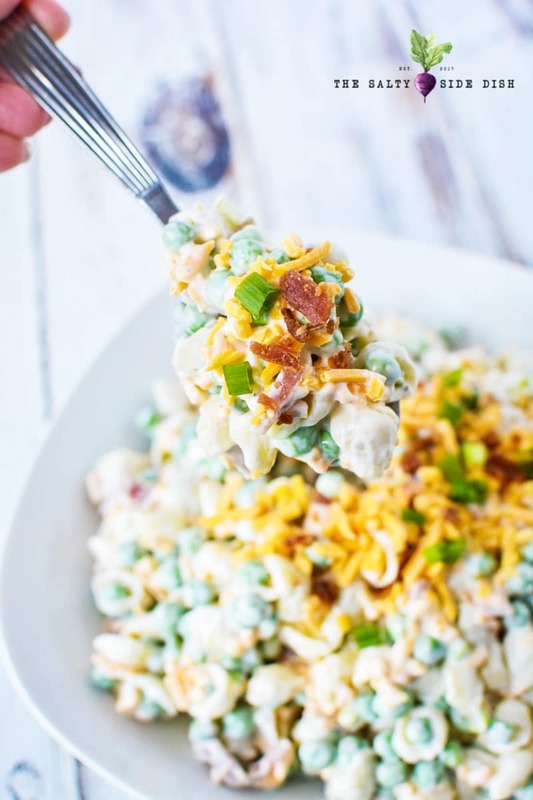 Not just covered in mayo, the tangy spices of ranch combined with the bursting flavors of bacon and cheese make this a pasta salad for the books. Pretty good? No, pretty amazing! 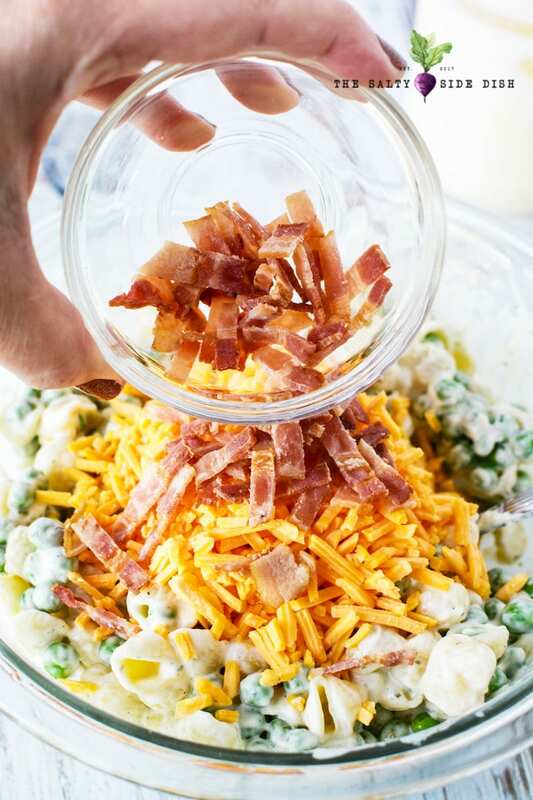 In a large mixing bowl, add pasta, peas, mayonnaise, cheese, onions, bacon and ranch seasoning. Mix well to evenly coat. Refrigerate for 2-4 hours or overnight before serving. Top with additional cheddar cheese and bacon before serving if desired.